T.J. Laramie has fought more than 150 times in his life. And he’s just 18. T.J.’s dad casually put him into martial arts classes when he was 13, at Maximum Training Centre in Ontario. Six months later, T.J. won his first match at a grappling tournament and he was hooked. He begged his dad to take him to every grappling tournament he could find. He wanted to fight someone in kickboxing but there weren’t many opponents available for a 13 year old at the time. There were opportunities in boxing, however, so he got into the boxing ring as an amateur and fought ten times. A few years later, when he could find someone to fight him, he racked up an impressive amateur kickboxing record of 11-0-1. Laramie has always been competitive and always looking for a challenge, even as a child. In grade school he played every team sport and was constantly excited to play. His obsession with winning and training like a maniac put him into constant grappling tournaments, kickboxing fights, boxing matches over the course of five years. His experience has put him on another level, he says. T.J. is able to dominate in the cage because no one can beat his amount of experience. After years of obsessive competing, his opponents may have more matches on their pro MMA record, but T.J. has the edge over them. “All those competitions got me to the level I’m at. Because at 17 years old I walked into the cage like someone who’s been there for the past ten years,” Laramie said. Laramie walked into the cage at 17 years old as a professional, in Japan. He went to Japan because he couldn’t get licensed as a professional in north America until he was 18, and he couldn’t wait to start. 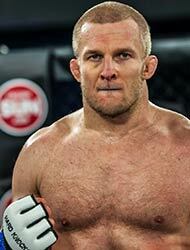 His obsession with winning and burning desire for competition led him to accept a fight against a professional MMA veteran with a record of 11-13, at a weight class ten pounds heavier than he was supposed to be. T.J. won the fight with a TKO in the first round. Laramie went on to fight two more times at a heavier weight class and he defeated both opponents. In his next bout at HK50 on June 17 he will face Brad Katona and finally compete in his desired weight class at 135 pounds. Katona, T.J. says, is not ready. And he has a message for Katona. Laramie does not like to be called a prospect. He has decided that he is going to create a legacy to the point where his name will be mentioned whenever someone talks about MMA, when they bring up the “greats” of the sport. He is all in, one hundred percent, to becoming a mixed martial arts legend. He has no backup plan and doesn’t need one. Currently Laramie trains two to three times per day plus a cardio session. His days consist of a 7:00 a.m. training session, an afternoon training session, a cardio workout and often a late night Jiu Jitsu roll. He has fought four times as a pro in the past two years but to him it is a slow pace. To T.J., fighting is the ultimate test of one person against another, the ultimate test of athleticism, technique and strength. There is nothing like competing, there is no other rush like it, nothing that can give him the same feeling. In his spare time, Laramie is a barber. It’s a stress reliever for him, almost therapeutic, and the schedule is flexible enough that he can train as much as he needs. Laramie enjoys being a barber, of course because he gets a challenge out of it. He even wants to open up his own barber shop one day, not his own MMA gym.